Cleaned boiler making new noises. Need to add chemicals? Had my boiler cleaned and flushed a few days ago. It was silent when he refilled and ran it before he left, but this weekend it's gotten noisier. Nothing crazy unbearable loud, but new and annoying. Sounds include a rapid popping or crackling noise in the boiler on start up just before the main gets hot. Reminds me of just before water fully boils in a pot on a stove - when the bubbles collapse before getting to the surface. Also there is banging/booming from within the boiler itself - lasts longer than the crackling but still only at the beginning of the cycle. 2 Pipe hoffman, 2008 Burnham gas boiler. 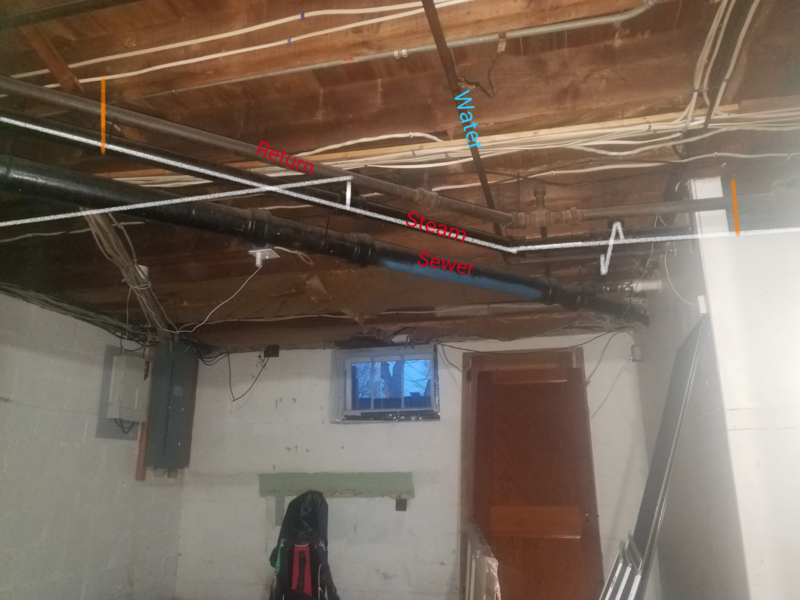 Uninsulated pipes. pressuretroll all the way down. Pipes pitched ok (1' section is level, but rest is good). Some here have said the header's wrong, but it's original wrong and hadn't been a problem before. Water level same as before flush and is stable +/- an inch or so while running. The boiler water had been green before flush (someone here has previously suggested it was squick or surgemaster) now it's clear or rusty depending on when in the cycle I look. There is no skim port so I guess it's never been skimmed. That's probably why the water was green - additives to sequester oils? My water is a little hard here, but only mildly. The plumber (on here) said he flushed out a fair amount of sediment. Hmm. Sounds' as if your boiler is cleaner then it has been in a long time. Over time, probably later this winter those "new" noises you are hearing will stop or be lesser than they are now. Give it a few weeks and see how the new break in period works out. hm I didn't think it would need to re-break in. Interesting. And if your system really is a Hoffman Equipped system -- is the Differential Loop still there and connected? 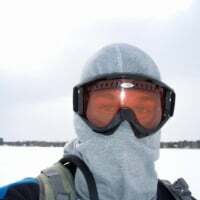 Get the pressure way down -- it must be kept less than 7 ounces per square inch for the Loop to operate properly -- and in any event get the steam mains insulated. 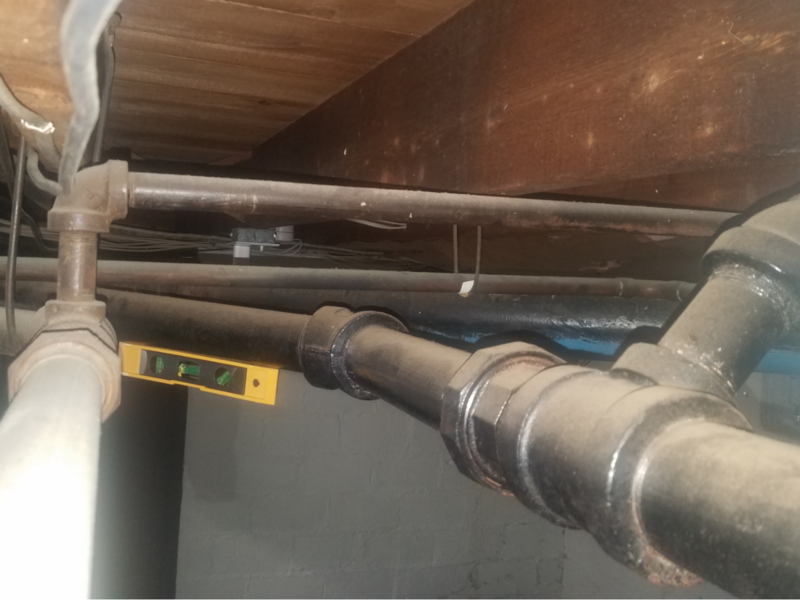 If someone has put vents on the steam mains, check and see if the crossover traps are still there and are operating. If they are, take the vents off and increase the main venting at the Differential Loop. Loop is still there. Original #11 vent still on it and still opens and closes. That's the only vent. Crossover appears fine and it stays cool through the firing cycle and the venting through the return via that crossover appears unimpeded. The plan is to add vapourstat on next months budget. Then insulate this summer. Ok, so maybe not a break in period. But you have cleaned things up nicely and the system sounds different. Over time that sound will soften. I didn't mean that sarcastically, but rereading it, it sure sounded that way. I got what you meant about breaking in and did think it was interesting that cleaning a system could bring out some sounds. It's now developed some water hammer during start up. It does go away after getting to temp, but again this is a new and distinctly different "clang" that I've never heard before. It clangs every, say, 15 seconds for a few minutes. I put some plastic shims in accessible pipe hangers and that quieted much of the creaking from what I believed to be thermal expansion. so that's nice, but this new hammer carries through the pipes and wakes me up when it kicks on in the morning. I know that I need to insulate and get the vaporstat - both are on the list and will likely help with noises - but It's really bugging me that these noises were absent a few weeks ago before the cleaning/fluishing. I'm getting more curious about water conditioners. Again, when we bought the house the water was almost neon green. And the water hammer was absent with that. Might squick or 8-way be worthwhile? Are they safe for the boiler and piping? 1. The horizontal pipe from boiler to Hartford loop. 3. Wet returns which are not lower than the water level. Squick is a diatomaceous earth which is purported, by the manufacturer, to absorb the oils on the surface, and then sink down to the bottom of the boiler. Once on the bottom, I believe it forms a crust, which can interfere with heat transfer. It is no substitute for skimming, which unfortunately takes many hours, but is very effective. 8-way is a cleaner, which should be used once, and then flushed out, followed by skimming. It is good for removing Squick. Many people like Steamaster tablets, (use half the dose recommended on the bottle). It colors the water a light purple. I wouldn't put any chemicals in there. They are almost never necessary in a residential boiler -- although Steamaster doesn't seem to actually do any harm. Couple of things to look at -- probably not related to the water hammer problem. On the crossover trap(s) -- the steam main(s) should get steam hot at them pretty quickly after the boiler starts firing -- certainly as fast as the radiators do, if not faster. If it (they) don't, there is a possibility that it (they) are failed closed. Also, if the pressure in the boiler goes over half a pound, two things should happen: the Hoffman Differential Loop should trip (you can check this by feeling at the top of it -- it should get steam hot) and the vent should close. You actually don't really want this to happen, as it indicates excessive pressure, but on the other hand that is the trick by which the Hoffman Equipped systems keep water from backing up into the dry returns -- where it can cause hammer, as well as dropping the water level in the boiler. So it is supposed to happen when the pressure gets over half a pound or so. On the water hammer -- it can be hard to track down, but not impossible. If it is really only happening near the beginning of a cycle, it's actually easier: feel along the steam mains or runouts to find out how far the steam has gotten when the hammering occurs. If the steam is part way along a section of pipe, and it goes bang (probably at the next elbow farther along!) that section is definitely suspect. Check for poor pitch -- or a sag. I do have a horizontal reducer on my header, but was not previously causing problems. I believe the mud leg was accessed and cleaned out. definitely heard a lot of banging at one point, I imagine it was wanded out at this time. water level steady, minimal bounce, no water loss. It's a short system mostly is visible from basement, no leaks seen. Based on temp, crossover trap is OK. dey return on other side of trap stays cool. not failed closed since it is venting fine. 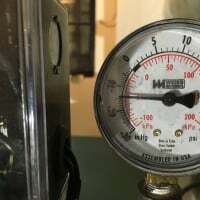 Pressure stays low according to 30 psi gauge, low pressure gauge to come with vaporstat. I've actually never felt the differential warm up at all perhaps it stays below pressure fine without the vapor stat? I'll try to feel for the hammer tonight. definitely have a small section of main that is level - only a foot or so at the beginning of a 10 foot straight away. Not sure how to change that without yanking on the pipes and I don't imagine that's a safe option. I doubt it, but as I do not have a skim port, can i skim effectively through the pressure relief valve? other skimming options? also, what is steam master supposed to do anyway? I'd cast a very beady eye at the straightaway... doesn't take much. And I'd not worry about yanking on pipes (well, within reason!) -- believe it or not, even a pretty big pipe can and will sag -- and can and will be pulled back up where it belongs. Use a very tight string from end to end to check. You can skim through the PRV tapping (PRV needs to be removed while do that) and only if it is on the side of the boiler. If it is on the top, no you can't skim that way. If side tapping, you must skim very, very slowly as that is only a 3/4" tapping. If you use Steamaster tablets, ignore the instructions on the bottle as they are wrong and will cause surging and foaming. Use 1 or 2 tablets only. Steamaster tablets help to balance the PH of the water and also has an oxygen scavenger in it. 8-way claims to also be a ph level treatment (which my litmus paper verifies), does anyone think there is harm from it other than overdoing it and getting the ph too high? Steamaster has not been discontinued but the distribution channel has been reduced. Thanks jamie. I think I found where the hammer is from. This 45 is maybe 1/3rd of the way along the main. Steam comes from the left and goes right. I sketched in the main and two radiator laterals in white and the two closest hangers in orange. I believe elevating the 45 would reduce the slope from the left and would give me some positive slope in that level pipe. is that an unreasonable fear? I figure I could use a bottle jack and a 4x4 to raise it slightly, attach new hangers on either side of the 45 , then remove the jack. Think that would be too much strain? 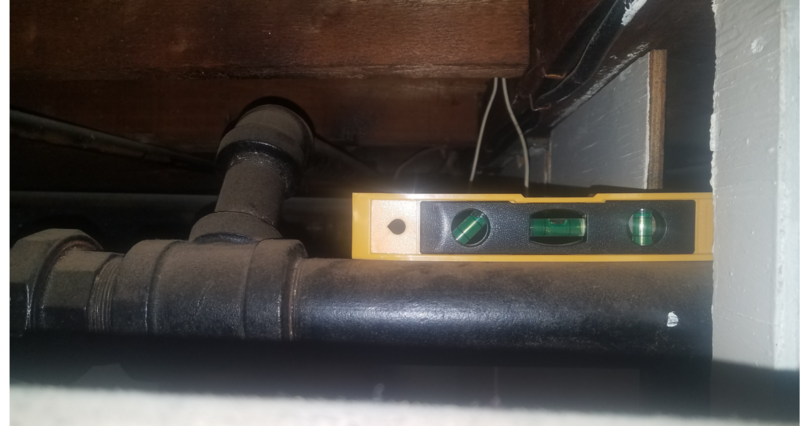 Aside from being annoying, does water hammer cause damage to the pipes? I'd rather put this off for a bit so I can work on renovating our nursery before the baby comes! It comes in with reasonable slope from the left. Then from the 45 on to the right, its flat, if not slightly back pitched to the next elbow. And no, the kind of water hammer we get with steam, while surely annoying, won't do much to iron pipe. It can damage vents, if they are so unfortunate as to get in the way of the slug of water, but not the pipes themselves. Just annoying. Thank you again, Jamie Hall. So glad to have you and everyone else here to share what they know!